Recently, a video of a moose chasing skiers at Breckenridge Resort went viral. While the video itself was pretty entertaining to watch, I was very thankful to see the original post had a warning about how dangerous and moody moose can be. Having had a close encounter with a moose during a backcountry backpacking trip near Eldora, CO I know how big and how scary they can be. I was so prepared for bears that I didn’t even consider what to do when encountering a moose. The moose saw us, was not intimidated by us AT ALL, and walked right up to where we were sitting in our camp. I jumped up onto higher ground via a large rock behind our campsite with my dog, quieted her, and let the moose know that while I was certainly NOT a worthy adversary, I would make it difficult for him to get to me. Shortly after my dog and I jumped up to higher ground and hid behind some trees, my husband joined us, and the moose, after considering whether he wanted to interact with us further, trotted away slowly. Thanks, moose. To be honest, I had no idea what to do. I watched the moose to get a sense of what it was feeling, and just made myself difficult to get to and quieted my dog noticing the moose did not look happy being barked at, but not knowing if that was right or not. Thankfully, it worked, but after getting home from the trip I made sure to read up on what to do when encountering wildlife so there would be no question next time. The photo you took with your phone is not going to land the cover of NatGeo (sorry). Photos are a great way to document our journey and show our friends and family what we’re up to. Decide if it is worth your safety as well as the safety of the animal. A lot of times, close encounters with humans can be deadly for animals, and in some cases people. So is your photo worth that animal being euthanized or you getting hurt? Can you take it from farther away? Does it really matter? Look up the area you’re heading to before you go. Research what wildlife you might encounter and how you can be respectful and conscientious of their safety and habitat. Is it rutting season? Remember, you’re lucky to be in their home. Headed to the backcountry? Be a noisy (and neat) camper. Most wildlife will avoid humans if they can hear them. Bring bear spray and if you’re camping, bring bear bags/tarps so your human food (and even toothpaste) smells don’t attract them to you. Ideally, you want to avoid an encounter with a bear at all costs but that’s not always possible. NO TOUCHING. Besides being incredibly dangerous for you, you don’t know how your smelly hands will impact that animal in relation to its pack or surroundings. So keep your hands to yourself (good rule in general). Driving through a national park? Pay attention to what’s on the roads and drive with care. The road doesn’t belong to just you. Know where you are. Are any species migrating at the moment? Be particularly careful driving at dawn and dusk (height of wildlife activity). So you’re face to face with a bear? Stay calm. Screams or sudden movements might startle the bear and could trigger an attack. Pick up any small children immediately. Make yourself large, wave your arms slowly and speak in a low tone, letting the bear know you’re a human and not a predator. Slowly walk away sideways and try to bring your stuff with you (if the bear finds food it will encourage them to have more encounters like this). Never place yourself between a mother and her cubs. Leave without turning your back on the bear. So you’re elbow to elbow with an elk? Give them space. If their fur starts to stand up or they start to shake or toss their head, you’re too close. Back away slowly and don’t run unless you are charged. If you are charged, RUN and try to find barriers to hide behind or keep between you and the elk. If you end up on the ground, protect your head and neck and stay down until the animal leaves. So you’ve made a moose mad? Moose are not messing around. Once again, usually these animals only start to get angry when you’ve gotten too close or startled them. Back away, don’t turn your back, make yourself hard to get to. If you have a dog with you, calm them down and keep them from barking. Moose and elk think dogs are weird looking wolves, and they will attack if they feel threatened. Same as with elk, if you are charged, RUN and try to get as many barriers between you and the moose. Moose are also pretty bad at changing direction so try to run to the side instead of straight out. If you end up on the ground, protect your head and neck and wait until the moose is a great distance away. Leave your space better than you found it. Follow the rules! Don’t start a fire where you shouldn’t SERIOUSLY. Pick up after yourself, leave the site in neat and safe conditions for the next outdoor enthusiasts and especially, the animals that live there. Enjoy your time in the wilderness. If you’re an outdoor person, you know the feeling. That feeling of serenity underneath a full sky of stars, looking over a ridge to see a beautiful valley and feeling like this is what life is all about. Just remember, the wilderness is no joke and demands respect along with appreciation. Looking to get prepared before your trip? Check out these wonderful resources! 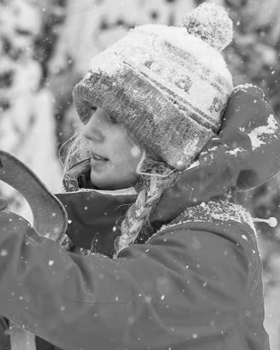 Abby joined the WinterWomen team in 2016 after moving to Colorado from Maryland. She loves cooking, dancing to live music, hiking in the mountains with her husband and dog, farming and gardening, and enjoying beautiful Colorado landscapes all year round.